On this day 25 years ago, August 6, 1991, the world’s first website went live to the public from a lab in the Swiss Alps. So Happy 25th Birthday, WWW! It’s the Silver Jubilee of the world’s first website. 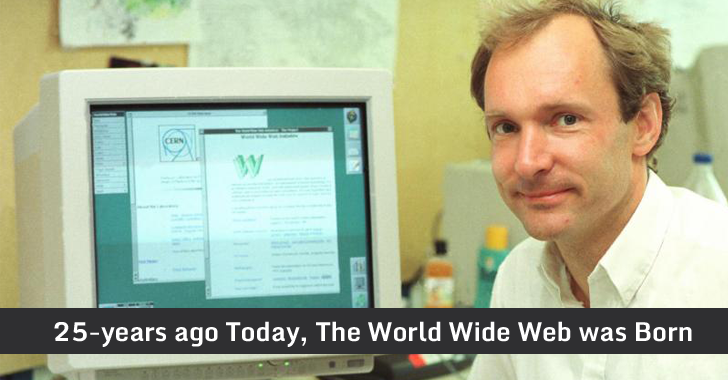 The site was created by Sir Tim Berners-Lee, the father of the World Wide Web (WWW), and was dedicated to information on the World Wide Web project. The world’s first website, which ran on a NeXT computer at the European Organization for Nuclear Research (CERN), can still be visited today, more than two decades after its creation. The first website address is http://info.cern.ch/hypertext/WWW/TheProject.html. "The WorldWideWeb (W3) is a wide-area hypermedia information retrieval initiative aiming to give universal access to a large universe of documents," the world’s first public website reads, going on to explain how others can also create their own web pages. "The project started with the philosophy that much academic information should be freely available to anyone." Berners-Lee wrote about the HyperText Transfer Protocol (HTTP) that outlined how information or data would travel between computer systems, as well as, HyperText Markup Language (HTML) that was used to create the first web page. Berners-Lee vision was to create a place where people could share information across the world through a "universal linked information system" – in which a network of documents (web pages) linked to one another could help users navigate to find what exactly they need. And so is the concept of the World Wide Web. Berners-Lee initially proposed the idea for a worldwide network of computers sharing information in 1989, while he was working as a computer programmer at the European Organization for Nuclear Research (CERN) in Geneva, Switzerland. The World Wide Web was written on a NeXT computer, made by the company Steve Jobs founded after he was kicked out of Apple back in 1985. "We bought a cool machine, the NeXT computer," Berners-Lee said two years ago during an interview at Rensselaer Polytechnic Institute. "NeXT was a machine made by Steve Jobs when he was kicked out of Apple [in 1985]… it had a wonderful spirit to it, a really good developer’s environment." "When you opened it, you got a pre-recorded message from Steve that said, ‘Welcome to the NeXT. This is not about personal computing. It’s about ‘inter-personal’ computing.’ It was perfect for designing the web." "This machine is a Server. DO NOT POWER DOWN." When Berners-Lee created the World Wide Web, his idea was simply to create a tool for scientists to find and share information with ease. The Web has since become the world’s most powerful medium for knowledge, communications, and trade — but that doesn’t mean he is happy with all of the consequences. Last month, Berners-Lee turned 61 and regretted a lot of things about his invention. He has primarily concerned that the Internet has now transformed into the "world’s largest surveillance network." Today, the Web "controls what people see, creates mechanisms for how people interact," New York Times quoted Berners-Lee as saying. "It is been great, but spying, blocking sites, repurposing people’s content, taking you to the wrong websites that completely undermines the spirit of helping people create." This is why the creator of the Internet is figuring out what the next step should be for the World Wide Web. The Web model relies on central servers and IP addresses, which can easily be tracked or blocked. Therefore, Berners-Lee is looking to decentralize the whole Web, the report said. "The web is already decentralized," he said. "The problem is the dominance of one search engine, one big social network, one Twitter for microblogging. We do not have a technology problem; we have a social problem." To eliminate middleman completely from all aspects of the Web. Still, all the major players do not agree to this decentralize approach. It’s still a question that whether the Internet needs decentralizing.